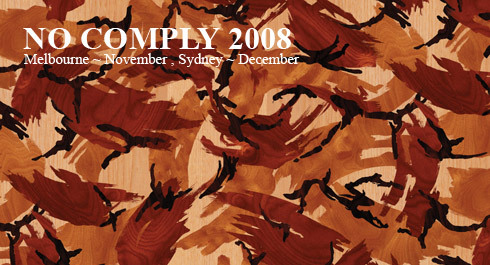 The exhibition shows 170 individual pieces by 80 artists and will be held at No Vacancy Gallery, Melbourne. Acorn (Can), Al Stark (Aus), Andy Sargent (Aus), Artless (Japan), Ashley Wood (Aus), B.Bot Defence Systems Inc (Aus), Beastman (Aus), Ben Brown (Aus), Ben Totty (Aus), Benzo And Monk (Aus), Bonsai (Aus), Cey Adams (U.S.A), Claudio Mantuano (Aus), Cope2 (U.S.A), Cycle (U.S.A), Dion (Brazil), Drew (Aus), Eamo (Aus), Enivo (Brazil), Ethics (Aus), Filur (Brazil), Ghost Patrol (Aus), Glenno (Aus), Horoiwa (Brazil), Hugo Atkins (Aus), Imaone (Jap), Indie184 (U.S.A), Inoue Jun (Jap), Insane (Brazil), Itch (Aus), Jae Copp (Aus), Jagi (Aus), Jahan Loh (Singapore), Jaz Loh (Singapore), Jee (U.S.A), Justin Lee Williams (Aus), Kab101 (Aus), Kano (Aus), Keith Ciarmello (U.S.A), Kngee (U.S.A), Kiki Hitomi (U.K), Krink (U.S.A), Lessly Repettaux (U.S.A), Luca Ionescu (Aus), Madsaki (Japan), Marty Schneider (Aus), Meggs (Aus), Mephisto Jones (New Zealand), Merry (Japan), Mhak (Japan), Miso (Aus), Mr. 44 (U.S.A), Nate Trapnell (Aus), Nails (Aus), Nero (Japan), Nior (Aus), Nurock (Aus), Oeil (Japan), Phibs (Aus), Phunk Studio (Singapore), Prakrti (Brazil), Puzle (Aus), Radio (Aus), Reka (Aus), Retos (Brazil), Rone (Aus), Sean Kelly (Aus), Senses (Aus), Shaunna Peterson (U.S.A), Sheone (U.K), Steve Gourlay (Aus), Str (Japan), Suiko (Japan), Sutu (Aus), Sync (Aus), Tenga (Japan), The Yok (Aus), Timba Smits (Aus), Two One (Aus), Weniki Hensch (Aus), Will Murai (Brazil), Wonderlust (Aus). 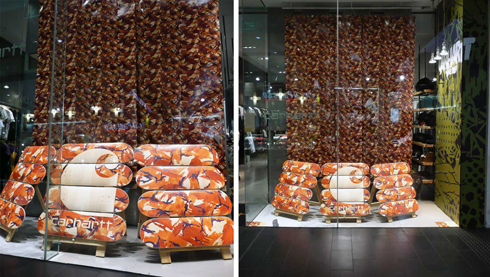 Supported by Carhartt Streetwear in Australia, exhibition’s organizer, participant, and curator Koan took the chance to turn the front window of our Melbourne Carhartt Store into a teaser for the upcoming art-show by using the No Comply 2008 woodgrain camo. Carhartt and fellow supporters Sneaker Freaker (offering a sneak peek, guaranteeing you to see skateboards like you have never imagined) and NiceProduce are each producing a commemorative Tee for the show. We’ll keep you posted, when they arrive. Sunday, until the 23rd of November. The show will also be touring to Sydney on the 12th of December and will be hosted at Red Bull Gallery in Alexandria.